Dettol Antiseptic Liquid provides your family protection against germs and has been recommended by mothers for generations. 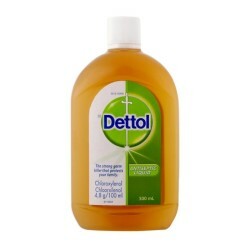 Use Dettol Antiseptic Liquid to kill 99.9% of germs. Use on the skin, to help protect against infection from cuts, scratches and insect bites. Always use as directed.<br /><br /><strong>Usage instructions:</strong><br />Directions for use: Wounds, cuts, abrasions, and insect stings: wash with 3 medicine measures (15ml) of Dettol antiseptic liquid to a glass of water.<br /><br /> Repeated application may give rise to hypersensitivity. Adhere to recommended dilutions, avoid usage in hypersensitive persons. Do not apply repeatedly. Directions for use: Wounds, cuts, abrasions, and insect stings: wash with 3 medicine measures (15ml) of Dettol antiseptic liquid to a glass of water. Repeated application may give rise to hypersensitivity. Adhere to recommended dilutions, avoid usage in hypersensitive persons. Do not apply repeatedly.